Sweet practice by UCSD, eh? 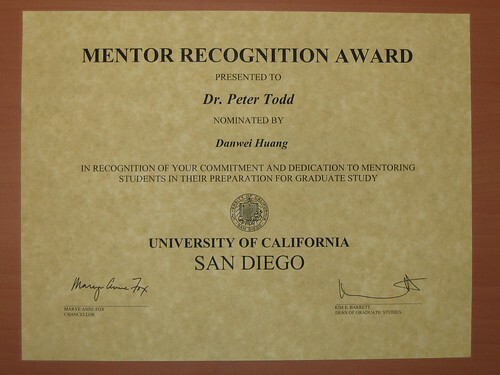 Congrats Peter! Janice and Lainie, the new BEJC coordinators for 2008! 29 Feb 2008 – Qie Lan (a.k.a. “Lainie”) & Janice Lee of the Conservation Biology Lab have taken over the running of the Biodiversity & Ecology Journal Club from the 2007 coordinators, Laura-Marie Yap and Eunice Tan of the Spider Lab. Laura and Eunice who held the fort since Jan 2007 handed over the reins of coordinators on 29th February 2008. The two new eager and able successors, Janice and Lainie, will communicate with hosts and speakers to setup seminars and keep a lookout for speakers we might want to invite down to the department. So the system is in place after a smooth transition and here are our poster girls erm, coordinators for 2008! Lainie and Janice, BEJC Coordinators, 2008. In the past year, we have been fotunate to listen to a variety of informative and passionate speakers, and the talks were well publicised to the community beyond NUS through departmental posters (Yong An Nee), departmental emails (Chan Yee Ngoh), Raffles Museum News (Ivan Tan), WildSingapore (Ria Tan), Ecotax and Habitatnews! See you at a seminar some time! March issue of Her World on newstands – Much excitement ensues among local scientific community! Five women scientists were featured in Her World this month, including Lisa Ng (Senior Scientist at the Singapore Immunology Network, A*Star), Rosemary Tan (CEO, Veredus Laboratories) as well as three members from our Biodiversity Crew. They are Joelle from Ecology and Systematics lab, Karenne from Marine Biology lab, and Nalini from Evolutionary Biology lab. You can read more about them in the article “Ladies and Germs”, Her World March 2008 Singapore edition, pages 160 – 164. It costs SGD$6.00 and is in stores now. 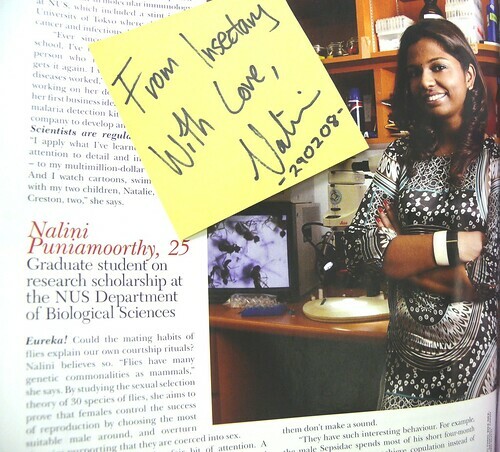 The Hrdy Visiting Fellowship in Conservation Biology for the 2008-09 academic year has been awarded to Professor Navjot Sodhi of the National University of Singapore. About the award – The Sarah and Daniel Hrdy Fellowsip in Conservation Biology serves to support the study of conservation biology within the Faculty of Arts and Sciences at Harvard University. The fellowship is awarded to an individual who will engage in scientific study and work in the Department of Organismic and Evolutonary Biology. The fellowship commences with an annual lecture in conservation biology by the distinguished individual chosen for the fellowship from outside Harvard University. It is the hope of the benefactors that this fellowship will have a strong and transformative effect on the study of conservation biology at Harvard, from the undergraduate to the senior teaching level. I thought you would pleased to hear that one of your papers (Oikos 2007) has been selected for Faculty of 1000 Biology and evaluated by Andrew Baird [link]. Faculty of 1000 Biology is an award-winning online service that highlights and evaluates the most interesting papers published in the biological sciences, based on the recommendations of over 2000 of the world’s top researchers. It was launched in January 2002 and already over 85% of the world’s top institutions subscribe. 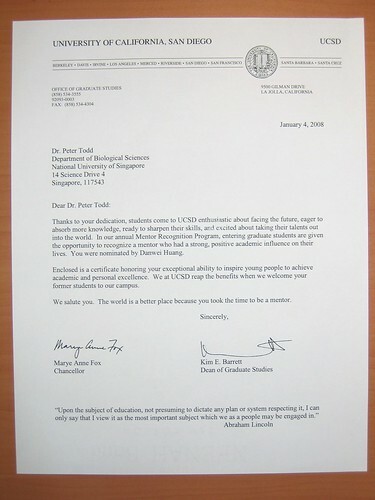 Papers are highlighted on the basis of their scientific merit rather than the journal in which they appear. To find out more about Faculty of 1000 Biology, visit our About pages. Many congratulations again on your success! 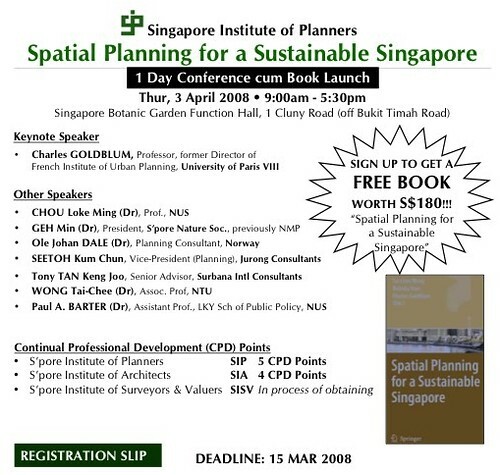 Spatial planning for a sustainable Singapore, 1-day conference, 03 Apr 2008. Thu 03 Apr 2008: 9am – 5.30pm at the Singapore Botanic Garden Function Hall, 1 Cluny Road (off Bukit Timah Road). “This 1 day conference involves a panel of planning experts who will explore the concept of sustainability planning and discuss the spatial development experience of Singapore over the last 40 years. The SIP Book ‘Spatial Planning for a Sustainable Singapore’ will also be launched at the conference. All registered attendants will get each a hardcover book published by Springer worth S$180 in the open market.